The main difference between microspore and pollen grain is that the microspore is a small spore in land plants, which develops into the male gametophyte whereas the pollen grain is a fine granule in seed plants, consisting of a reduced male gametophyte. Furthermore, microspore is a unicellular structure while pollen grain is a multicellular structure. Microspore and pollen grain are two structures in male sexual structures of plants. They develop the male gametophyte. 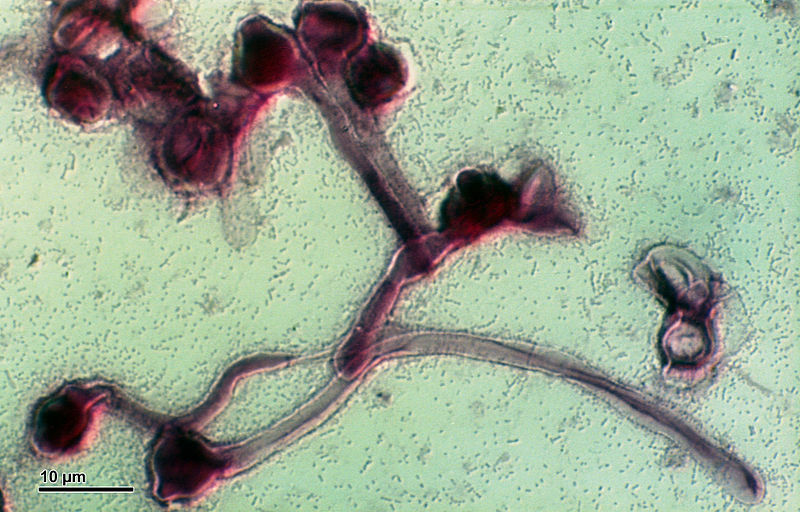 Microspore is one of the two types of spores produced by heterosporous land plants. It is small and the large type of spore is the megaspore. 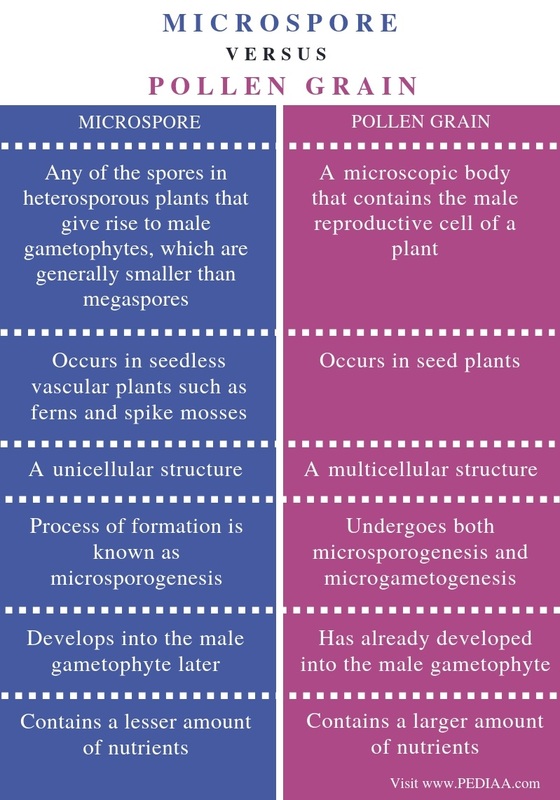 Microspore develops into the male gametophyte while megaspore develops into the female gametophyte. Hence, microspores and megaspores link the sporophyte stage to the gametophyte stage in plants which undergo alteration of generations. Further, male gametophyte produces male gametes while female gametophyte produces female gametes. Diploid microsporocytes in microsporangium give rise to haploid microspores by undergoing meiosis. Microsporangia occur in modified leaves called microsporophylls. This process is known as microsporogenesis. Three layers that cover the microspore are perispore (the outermost layer), exospore (the middle layer), and endospore (the inner layer). Perispore shows the highest thickness among the three. The development of microspores can be seen in ferns, spikemosses, and quillworts. 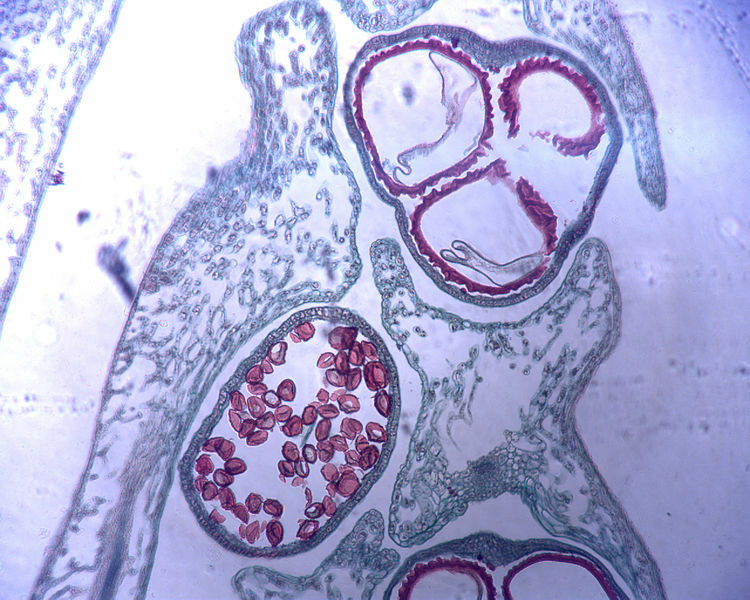 Microspore in seed plants develops into a pollen grain. Pollen grain is the reduced, male gametophyte in seed plants, angiosperms, as well as, gymnosperms. This means, microspore of these plants further develops into the pollen grain. In gymnosperms, clusters of 50 or more microstrobili develop in a pollen cone at the tips of the lower branches of the tree. The microsporophylls of gymnosperms contain a pair of microsporangia, which comprise of microsporocytes. The microspores developed through meiosis of microsporocytes then develop into pollen grains in a process called microgametogenesis. Each pollen gain consists of four cells and a pair of external air sacs. In angiosperms, the mass of cells that give rise to pollen grains is organized into four sacs in the anther. It is made up of microsporocytes, which undergo meiosis to produce microspores. These microspores then undergo mitosis and a double layer is formed surrounding the microspore, producing the pollen grain. Since the pollen grain contains mast cells, which are haploid, it is called the male gametophyte. Upon pollination, it germinates to form the two male gamete cells. Microspore and pollen grain are two structures produced by diploid microsporocytes through meiosis. They are produced by heterosporous plants. They represent the male part during sexual reproduction. Their formation occurs through a process known as microsporogenesis. Both are haploid and tiny structures. Microspore refers to any of the spores in heterosporous plants that give rise to male gametophytes, which are generally smaller than megaspores whereas pollen grain refers to a microscopic body that contains the male reproductive cell of a plant. This explains the main difference between microspore and pollen grain. Microspore occurs in seedless vascular plants such as ferns and spike mosses while pollen grain occurs in seed plants. The respective structure is another difference between microspore and pollen grain. Microspore is a unicellular structure while pollen grain is a multicellular structure. The development cycle is another important difference between microspore and pollen grain. The formation of a microspore is known as microsporogenesis while pollen grain undergoes both microsporogenesis and microgametogenesis. While microspore only undergoes meiosis, pollen grain undergoes both meiosis and mitosis. Microspore develops into the male gametophyte later while pollen grain has already developed into the male gametophyte. Furthermore, microspore contains a lesser amount of nutrients while pollen grain contains a larger amount of nutrients. Microspore is a small spore, which develops the male gametophyte. It occurs in seedless, vascular plants like ferns. In seed plants, microspores further develop into the male gametophyte, forming the pollen grain. The main difference between microspore and pollen grain is the development and structure.